With so many computer animated movies these days, the magic of animation seems to have gone the way of the dodo. Thankfully Disney continues with tradition and even though computers play a part in their animation techniques, their animation still has this true Golden Age of Hollywood to it. 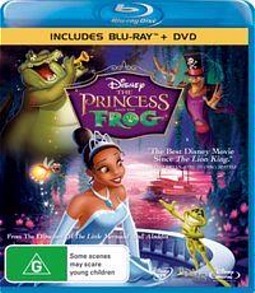 One of their latest movies to land on Blu-ray is The Princess and the Frog which stars a stellar cast of actors that include Anika Noni Rose, Bruno Campos, Keith David, Jenifer Lewis, Jim Cummings and even Oprah Winfrey and John Goodman to name a few of the stars who grace this movie. With parallels to many Disney films before it, The Princess and the Frog is a retro fairytale which revolves around Tiana (Anika Noni Rose) and Prince Naveen (Bruno Camps). The main protagonist is Tiana who is following in the footsteps of her late father, however her life soon changes when she becomes involved in Prince Naveen, a handsome prince who is hiding more than just his good looks... albeit froggy ones for now. This prince was turned into a frog by the evil voodoo Doctor Facillier (Keith David) and he believes that Tiana is a princess and upon kissing her, he will turn back into a prince. Unfortunately his plan backfires and Tiana is also turned into a frog. From human to reptilian, both must work together to undo this evil and thankfully are helped by some other talking animals that include an alligator named Louis (Michael-Leon Wooley) and a Cajun firefly called Ray (Jim Cummings). The Princess and the Frog is a well written story that features some wonderful characterisation which includes drama, action and comedy which children of ALL ages will simply adore. The standout characters for me included Tiana, Prince Naveen and the evil Dr. Facillier who is quite creepy and is reminiscent of other evil fairytale villains. As with most Disney films, song plays an integral role to the plot and there are some wonderful songs in the movie that helps give the viewer another insight into the characters they are watching. Not to mention bop along! The Blu-ray version of this movie is quite spectacular, especially with the faux hand-drawn animation which almost comes to life on Blu-ray with its amazing colour palette and impressive drawn characters. This Blu-ray version also contains the DVD disc of the movie as well which is ideal for watching the film in more readily available places such as other rooms or even the car which probably don’t have Blu-ray capabilities. This Blu-ray version is also jam packed with special features and Disney once again proves why they are the masters of this domain. From behind the scenes featurettes to games and commentary, The Princess and the Frog is truly a 10 out 10 for special features. What Do You See: Princess Portraits — A bayou-style quiz tests viewers’ knowledge of all of Disney’s beautiful princesses. Ray’s firefly family creates twinkling portraits of each princess, and if the player correctly identifies her, they can enjoy a tongue-cheek mini re-telling of that character’s story. Magic In The Bayou: The Making of A Princess — Co-writers and directors John Musker and Ron Clements take a freewheeling, behind-the-scenes look at the making of Disney’s newest animated film as it grows from an initial concept to a lavish animated film set in the enchanting world of New Orleans and the surrounding bayous. The commentary behind the movie is quite insightful and I must admit that although I didn’t enjoy it as much as the movie itself, it was still quite a entertaining experience because it was handled quite lightly as opposed to heavy technological babble or a justification of the story. Bringing Life to Animation with an introduction by John Musker and Ron Clements was another highlight because it showed how live action was used to assist the animators in transforming 2D into an almost 3D experience. If you buy or rent this disc, I recommend that you watch all the special features. In the end, The Princess and the Frog is a delightful magical experience that mixes traditional animation techniques with a modern retro fairytale set in the lush local of Louisiana. Great characters, a great story and a story that can be watched by everyone. Highly Recommended!